1. With Wavecome double frequency GSM module. 2. With color LCD show screen and keyboard on the host. 3. 10 wireless guarding zones (1 wireless SOS zone, 1 fire alarm zone, and other 8 wireless guarding zones can be defined by user ) and 1 external power failure alarm zone. 4. Send SMS to 3 preset mobile phone numbers automatically while alarming. 5. 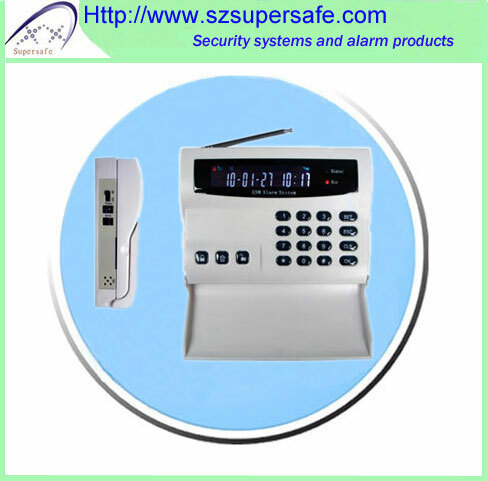 Call 3 preset phone numbers automatically and monitor at site while alarming. 6. Set the time of arm/partial arm/disarm. 7. Arm/disarm by the keyboard on the host, remote controller or SMS. 8. Program the alarm host by keyboard or SMS. 9. Modify the name of 8 wireless guarding zones and inquire the status of alarm host by SMS demand. 10. Define the 8 wireless guarding zones as arm/partial arm by keyboard on the alarm host. 12. The alarm host automatically stores system status, while its power is off.